Once your book text is imported into an epub file, you will need to style it using CSS. To do this you could use ‘inline’ styles, but that is inefficient and difficult to update. The most elegant, and efficient, way to apply CSS styles is using a CSS stylesheet. This post covers how to create and then link a CSS stylesheet in your e-book. Subsequent posts will cover how to define the CSS styles and more importantly which CSS styles will work with Kindle and which will not. Obviously, as this is a new, blank, stylesheet, there is nothing in it yet! 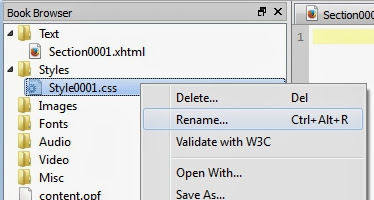 It can be closed by clicking on the red ‘☒’ to the right of the filename in the tab at the top of the window. Re-open the tab by double-clicking the filename in the book browser. The stylesheet does not need any sort of header, and should NOT contain ANY html. This style will be automatically applied to every paragraph in the ebook. Make sure the style is reproduced exactly as shown. The capitalisation is important, as are the spaces and semicolons and all other characters. A SINGLE typing error will cause the style to be ignored. In this case the style causes the paragraphs to be fully justified and to be indented by 1 em. An em is the width of the letter ‘m’ in the chosen font. The margins have been set to zero. Note that the unit must be typed closed-up to the number, without a space. The syntax for CSS, which styles work with Kindle and how to replace the markup you entered in your MS Word file with CSS are all covered in future posts. The example above is just to show how easy it is to write a CSS style. Note that ‘../Styles/’ is the path to the stylesheet. The chapter is in the ‘Text’ folder and the stylesheet is in the ‘Styles’ folder. BOTH are in the ‘OEBPS’ folder. 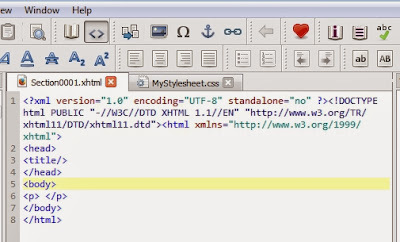 The two dots tell the ebook reader to look in the enclosing (OEBPS) folder to find the stylesheet in the Styles folder. 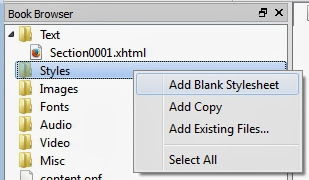 The filename of the stylesheet in the link must of course exactly match that of the actual file. The stylesheet needs to be linked in EVERY chapter, although Sigil will automatically create the stylesheet link when you split a chapter, saving you a lot of work. 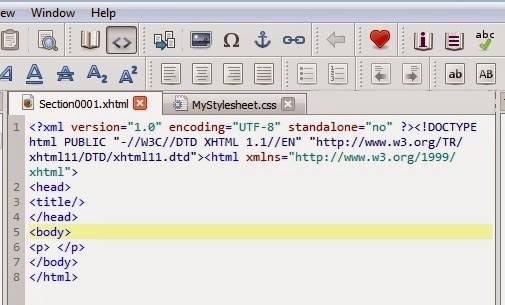 And that’s it, you’re ready to begin defining styles in your stylesheet to format your ebook. Next Steps: You will need to enter styles in the CSS stylesheet to match each of the markup codes you entered earlier and then apply those styles using find and replace. Only certain CSS properties are supported in the Kindle and the next post in the series lists CSS properties which work with Kindle and gives examples of CSS styles which use these properties and match the markup codes I use. You can find a primer on how to get started using Sigil here. Another post covers the syntax of CSS. A Phoenix can rekindle a flame?